The earliest rchaeological evidence of wine productioEveryone knows wine has been around a long time, but how long is difficult to say precisely. Several different countr'es claim to hold the birthplace of wine; all fall in the range of 4000 BC to 6000 BC. Prior to this, some biological archeologists (e.g., Patrick McGovern, at the University of Pennsylvania) theorize early man may have tasted the naturally fermented fruit rather than intentionally making wine. They guess that more than 7,000 years ago, Paleolithic humans drank the juice of naturally fermented wild grapes inocculated by airborne yeast. The grapes left in harvesting vessels naturally fermented. The gatherers tasted the resulting alcoholic swill, liked it and later put it in animal-skin pouches or crude wooden bowls, [erhaps intentionally reproducing the process. Georgia (near Russia) says they can show excavations that date to 6000 BC which would be the oldest evidence of intentional winemaking.More on this in the next section. Iran claims sites that date back to 5000 BC or 7,000 BC, depending upon who you trust. The University of Pennsylvania Museum's Mesopotamian gallery has what they say is the world’s earliest known wine jar, more than 7000 years oldfrom Hasanlu in Hajji Firuz, Iran. The jar, which had a capacity of approximately 9 liters (2.5 gallons), contains a reddish colored residue that Dr. McGovern says is grapes. The jar was sunk into the floor of a Neolithic house at HF Tepe in North West Iran .There is even a Persian fable in which wine was the accidental discovery of a princess intending to commit suicide with what she thought was poison (her father, the king, labeled it "poison" so no one would drink his newly discovered favorite beverage). Apparently, she decided to continue living when she discovered that the boring royal court was much more pleasant when you are drunk. Sounds a lot like watching C-Span. Clear wine production was important im anceint Greece and the Roman empire. The Greeks worshiped gods of wine and partying, Dionysus and Bacchus. The Romans inherited this practice and even Jews and Christians celebtrated wine (recall the Last Supper?). Wine production and consumption grew dramatically from the 15th century. 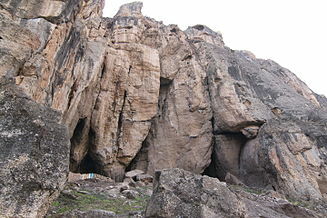 The oldest-known winery was discovered in a cave in Armenia and was dated to 4100 BC, What makes this site a clear winner in the contest for oldest wine production was that the site contained a wine press, fermentation vats, jars, and cups and even Vitis vinifera seeds, the variety of grape still used to make wine today.